It’s a sad fact of modern life that many marriages, civil partnerships and other living together arrangements end in separation, and, in the case of marriage, divorce. Resolving issues between the parties to end the relationship can be a minefield. Invariably, solicitors get engaged to help with the resolution. What isn’t always known is that there are different options available to “manage” how to achieve a resolution. We’ll look at these options and how these might help rather than hinder the process. There is a completely unfounded belief that the separation can be dealt with amicably until the lawyers become involved. The bottom line is that each party has rights on separation or divorce and some of these conflict. Once a client has been advised of those rights, they may take a very different stance from that taken before they sought legal advice. Solicitors seek instructions from the client and give clients advice based on the law – solicitors don’t make decisions for clients and only take actions based on the decisions reached and instructions given. When parties separate, they have four options available to them to reach a resolution of the issues between them. These are likely to involve children, money and assets. The different needs of the parties will impact on the shape of any resolution. When parties separate, their first instinct is to protect their position and normally seek advice about this from a solicitor. At the first point of contact with a solicitor, the options available to resolve the issues will be set out. The options are Solicitor Negotiation, Collaborative Practice, Mediation or Litigation. Until fairly recently, solicitor negotiation was the most common form of resolution with each party instructing his or her own solicitor. After receiving instructions, one solicitor writes to the other party’s solicitor setting out the client’s position and seeks information about the other party’s position. The other party’s solicitor takes instructions and then replies setting out the other party’s view. This is then explained to the client and further instructions are sought. This process and exchange of letters repeats itself until an agreement is reached between the parties. Once an agreement is reached, the terms of that agreement are set out in a Minute of Agreement that both parties sign. That agreement sets out the arrangements between the parties and is binding on them. If an agreement cannot be reached, the next option is generally litigation. There are, however, two alternative methods of reaching an agreement between the parties that can lead to a quicker and, perhaps, cheaper and more equitable settlement – Collaborative Practice or Mediation. In Collaborative Practice, each party will have their own solicitor, but they will sign up to a collaboration agreement committing themselves to settle the issues between them without resorting to the courts. Both parties and their solicitors will be present at meetings. The parties will set out and discuss the issues between them, look for solutions to the problems facing them and attempt to reach an agreement across all of the issues that are raised. If further information is needed, third parties can be asked to attend and supply information or give advice to the parties in the meeting – a common instance of this would be specialist financial advice. Each of the parties will be advised separately by their solicitors outwith the meetings. What takes place in the collaborative process is confidential with the exception of any financial information which may be used outwith the process. Once an agreement is reached between the parties, this can then be set down in a Minute of Agreement that then becomes binding on the parties. If matters cannot be resolved and one of the parties decides to seek a resolution through litigation, then the solicitors involved in the collaboration cannot then represent the parties in the court proceedings. Mediation is another alternative means of resolving issues between the parties. In the mediation process, whilst each party will have their own solicitor, they agree to appoint a Family Mediator to mediate arrangements between them. The Mediator doesn’t represent either of the parties but seeks to work with both parties to resolve the issues between them and to help them reach agreement on what should be done. This normally involves a series of meetings with the parties. The Mediator will provide a summary of the mediation and when it is successful, the solicitors for the parties can then enshrine what has been agreed in a Minute of Agreement that is binding on the parties. As in the collaborative process, confidentiality is preserved except in relation to financial information that can be used outwith the process. Collaborative Practice and Mediation have the parties at the heart of the whole process with the focus on the best outcome for all involved. These methods of dispute resolution can also provide solutions that would not otherwise be available to the courts if the parties had to resort to litigation. 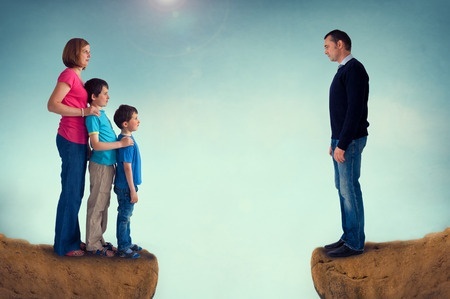 There are obviously circumstances where Collaborative Practice and Mediation are inappropriate, for instance, where there are concerns about the welfare or security of any children or where there is an element of domestic violence. In such circumstances the only options available are solicitor negotiation or litigation. A more recent option introduced into Family Law practice is Arbitration. This is an alternative dispute resolution option and can help avoid having to go to court. Whereas in Collaborative Practice and Mediation the parties come to an agreement, in Arbitration, the parties agree to be bound by the decision of the Arbiter. Arbitration is unlikely to deal with all of the issues between the parties and is more likely to focus on single issues. These can be things such as when the actual date of separation occurred from a legal standpoint or how much aliment should be paid or what the matrimonial assets are worth and the like. The Family Law Arbitration Group Scotland provides answers to many questions about Arbitration on their website. You can access that by clicking here. Finally, if all else fails, the parties can resort to the courts who will then hear the facts and circumstances and impose a ruling that it binding on both parties. Litigation can be lengthy and expensive and, sometimes, delivers a resolution that neither party is happy with. If you find yourself in the unfortunate position of separating from your spouse or partner and require our help, call us on 01698 373365 or click here to email us.